A manager of the Exmo Bitcoin exchange has been kidnapped in Ukraine. According to Russian and Ukrainian media reports Pavel Lerner, 40, was kidnapped while leaving his office in Kiev's Obolon district on 26 December. The reports said he was dragged into a black Mercedes-Benz by men wearing balaclavas. Police in Kiev confirmed to the BBC that a man had been kidnapped on the day in question, but would not confirm his identity. Big dive in prices across the board. Bitcoin is approaching a 50% drop from its all-time high. Any theory as to why? Government regulation issues in China and Korea. 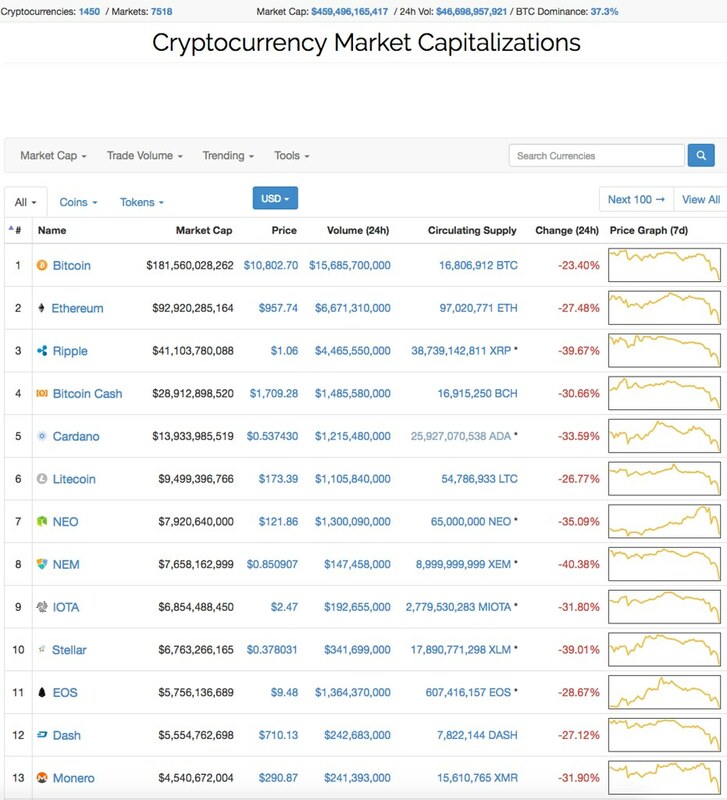 I have not seen posts about people buying up crypto on the cheap. Probably for the same reasons they don’t buy the stock market when it goes on sale during a crash. I guess I'm weird that way. I keep 10%+ cash in my of my brokerage accounts for this scenario. Because it looks like a head and shoulders top and no trader worth his salt chases one of those. And the market is driven by Japanese forex traders who have nothing to go on but the chart (Bitcoin has no fundamentals like a P/E, dividend, or even a usable metric beyond market cap) so ugly charts matter. It also feels troubling that Bitcoin has value because it is going up and it is going up because it has value. The bigger question is if the investment banks who allowed users to buy calls actually kept the puts on their own books. It will be interesting when quarterly data comes out on the banks (maybe next quarter). Very interesting that to the believers Bitcoin is an unshakeable "store of wealth" but to the traders it's a high volatility forex version of three card monte. I worry one of those two is correct. No, but I started contributing to a Roth IRA through my employer in addition to the 401K matching. Is there any truth in the concern that the amount of electricity used in maintaining the block chain and mining is unsustainable? I have heard several people reference this issue in the last few weeks and can’t tell if they are just talking to have an opportunity to say “I told you so” if a crash occurs or if the underlying technology in Bitcoin requires an unsustainable amount of electricity. Analysts Michael Weinstein, Khanh Nguyen and their team at Credit Suisse took a look at the issue, and in a research note out today they conclude that fears of cryptocurrencies overwhelming the power grid are overblown. Start by comparing bitcoin’s 20,000 gigawatt hours per year with the 4.3 million Gwh used in the U.S. last year and 6 million by China. The analysts figured that if the price of bitcoin rose to $50,000, miners would find it economic to boost their efforts such that they would consume more than 350,000 Gwh, still less than 2% of world power capacity. The team also calculated the bitcoin price that would be needed to incentivize miners to gobble up all the world’s generation capacity: $1.1 million per coin. In the long run, says Credit Suisse, the breakthrough far more likely to rile world energy markets is the electric vehicle. If, by 2040, EVs grab a third of new-car market share, the world could require more than 280 gigawatts of additional power generation capacity — or somewhere in the vicinity of 2.4 million Gwh. But again, that’s figuring on current technology. After 25 years of improvements, lithium ion batteries are going to keep getting better. Enjoy the dip as you sue the members of this board. People like me are very careful when we talk finance recommendations but those who have lost 50% in crypto over a couple weeks can easily find posts that they are literally buying electric gold. You have a paper trail of people telling you to invest in snake oil. Enjoy the lawsuit. We assume that everyone here is intelligent enough to know the value of free advice provided by random anonymous Internet-users. Enjoy the dip as you sue the members of this board. Nice... Threatening members...via false proxy. I live my life following advice from random anonymous internet users. At the very least I exited Bitcoin prior to the IRS issuing guidance on how to report it. In a very real (and very legal) sense I have incorrect tax returns. So even though I did my best and likely paid the correct rate I'm not in compliance technically. Add on to that that not every country has the same fiduciary laws and some of the things I have posted could be construed as borderline criminal in some places globally. Not a good thing for an avid international traveler like myself. In fact I already have plans for international travel and I'm looking into legality of things I have said about finance after being tipped off to be careful by a member of my mastermind group. Even if you're stateside there is no guarantee of safety. It only takes one idiot like a Jeff Sessions to believe that by being into Bitcoin you are somehow involved in financial crimes or money laundering. And they've been going hard into Coinbase (not a safe place to store currency). Last, on the extreme end and a healthy dose of tinfoil, there is a conspiracy here. Or maybe it was just an accident that Asian countries announced crackdowns immediately after the big banks sold calls and kept all the puts internally. Now that the banks have made millions selling worthless futures contracts and the fix is in the government will swoop in to provide "regulation" for the foolish people who bought up contracts worth slightly less than a fart in the wind. What happens when Bitcoin gets its very own Mueller? Frankly looking back I could be accused of 'pump and dump'. I rwalize this is fringe stuff. But the government want this tech squashed. It's not beyond me to believe the banksters would make millions on their futures selling only to turn around and claim that the little guy miners were defrauding them about the true value of Bitcoin. I'm surprised there hasn't been a class action against the development team already. I might not be well spoken at all times and a little glib but there are a lot of landmines around. I didn't know you followed the crypto currencies Cedar. What is the “thing” that gives Bitcoin its value? Is it a straight fiat currency, or does fiat currency derive its value from the backing of a government? Is bitcoin valuable because it is transferable into a fiat currency like the usd (a fiat currency backed by a fiat currency)? To go back to my question of a couple days ago is Bitcoin valued because of the willingness of groups to pay the electric bill to maintain the blockchain in exchange for getting Bitcoins kicked out to them from time to time? It covers a lot of ground, with the "value" question addressed in the last half. Sometimes. I don't know alot about it, but have posted in the past. Mostly come to read about it though. Thanks Freelancer, I’ll give it a listen this weekend. Mr. Antonopoulas is very confident about the future of Bitcoin. He sounds almost messianic. Nothing wrong with that, and maybe he is right. His enthusiasm appears to be getting compensated with donated Bitcoins, so his money is where his mouth is. I have not heard him address another aspect of working with Bitcoin that makes me remain a skeptic: by not being a government currency, it does not have to be used. Government currency seems to have a built in advantage by being the system a country uses to collect taxes. Being a citizen of the USA comes with a built in liability of having to pay taxes. And the government can protect its currency by requiring me to use its currency to pay my taxes. On the flip side, if I want to receive welfare from the government, it can require me to receive it in its currency as well. As long as the major economic powers of the world refuse to accept Bitcoin for payment of government obligations, or offer to allow people to receive government payments in the form of Bitcoin, it is going to be second fiddle to government fiat currencies, isn’t it? Antonopolous seems to think governments will eventually accept Bitcoin, but I’m not clear on how they will come to the conclusion that using Bitcoin helps them manage their economies. I see a town in Switzerland is allowing Bitcoin for tax payements, and you can buy citizenship in Vanuatu with Bitcoin, but I don’t consider those to be the kind of national econimic powerhouses that need to come on board. Antonopolous seems to think governments will eventually accept Bitcoin, but I’m not clear on how they will come to the conclusion that using Bitcoin helps them manage their economies. Thanks so much for the index, Freelancer! I would have passed this video by if you hadn't posted the index. I bet he has a LOT MORE than his original investment now though. No, look a month or two back on this thread, Andreas has been upfront about how he was forced to sell most of his BTC between 2014 and 2016 to pay debt and support his family. For as much as he’s done, he doesn’t have much to show for it. He’s kind of like a wandering missionary monk who’s taken a vow of poverty. Well ,it did help his economy. I sold at $1500 a coin and while I could have done better,I still did quite well. I have still some in the newest launching of crypto and if one or two take off,I will be happy again.Kind of like calling the lottery an investment. Reading up on bitcoin and the post here as well. I am still not sold on this. More will have to come out about it before I even think about buying in on this.